The 4K Ultra Short Throw Projector, available in the U.S. by mid-2014 for US$30,000 to $40,000, is being demoed at International CES after Sony President and CEO Kaz Hirai announced the gadget in a keynote speech on Tuesday. The device, 110 centimeters (43 inches) long, sits next to a wall and resembles a piece of furniture like a low cabinet. 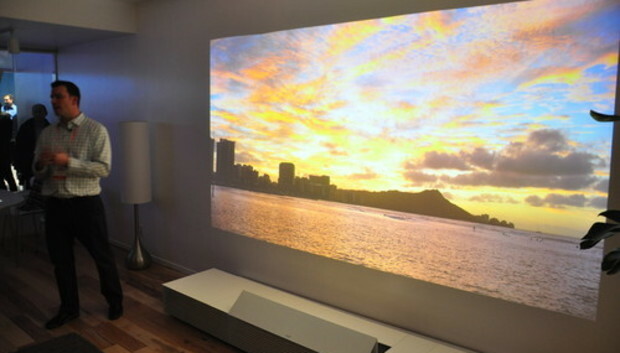 The demo unit projected 4K Ultra HD images by firing a laser diode at a wall made of standard drywall, playing back clips of the 2013 science-fiction film "Elysium" in eye-popping quality. "This state-of-the-art device can be placed anywhere in the home, turning the environment into a dynamic living space," Hirai said in his keynote address. "Normal walls will become fluid displays." "You can create a window with a view of the outside which transitions throughout the day, or you could turn your favorite movie scenes into wall art, with gradual transitions bringing mood and atmosphere to the places where you live and work." Hirai described how the projector turned part of his office at Sony's Tokyo headquarters into a 4K-resolution virtual window into Ginza, a posh shopping district in the Japanese capital, via a live stream video link. "Imagine being an avid surfer and having the perfect wall-sized window to see the world's best surf spots vividly in real time in your living room," Hirai added. "Or perhaps you can't make the concert tonight. Now, you and your friends can have a private skybox view."